This isn’t some existing Mercedes-Benz vehicle with an electric powertrain slapped inside. This crossover was designed from the ground-up to be something all new, and to kick off a brand-new era for the Mercedes-Benz brand. It is, after all, the very first model in the automaker’s “EQ” brand, which is dedicated to electric mobility. The new Night Design will give the 2020 Mercedes-Benz EQC a look all its own. The large black-panel surface enclosing the headlamps and grille is impressive by itself. But at night, the Mercedes-Benz star will be illuminated at all times. This futuristic look hints at high-tech highlights under the hood. The electric powertrain sports an innovative setup, with an electric drivetrain at each axle. This setup boosts efficiency, with the front electric motor optimized for low to medium load range and the rear motor on hand to add sportiness. Together, this setup achieves 402 horsepower and a maximum torque of 564 lb.-ft. As for mileage, the 2020 Mercedes-Benz EQC is estimated to travel more than 270 miles on a single charge. So get ready to roam. 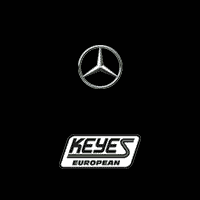 While you’re waiting for this upcoming crossover, head into Keyes European and check out all of the Mercedes-Benz models for sale this month. When you find the model that’s right for you here at our dealership near Los Angeles, CA, Mercedes-Benz financing can help you take it home.